Heat oven to 350°F. Grease bottom only of 13x9-inch pan with shortening. Make cake as directed on box with water, oil and egg whites. Stir in holiday decors. Pour batter into pan. Bake 28 to 33 minutes or until cake springs back when touched lightly in center. Cool completely, about 1 hour. With small plate or top of jar for pattern, cut 1 (4-inch) round and 1 (5 1/2- to 6-inch) round from waxed paper. Spread frosting over cake. Place waxed paper rounds on frosted cake to make snowman shape with larger round at bottom. On each side of snowman pattern, carefully drop 2 drops of food color; swirl with knife around snowman to resemble sky. Remove and discard waxed paper. 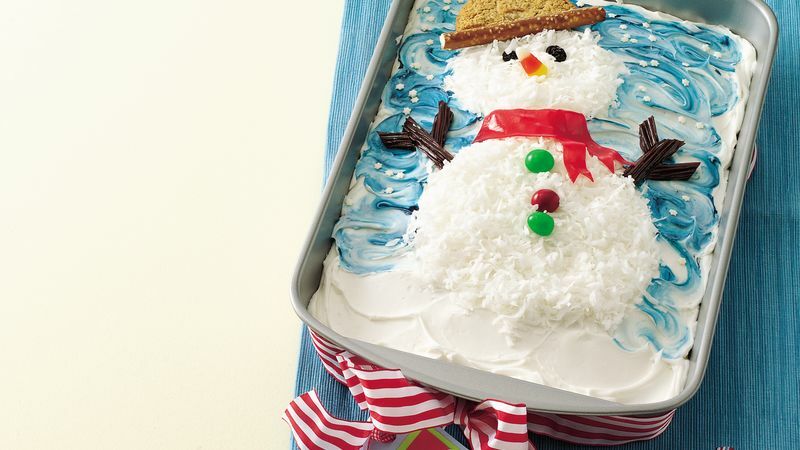 Sprinkle coconut on snowman, filling in round shapes completely. Decorate with peanut candies for buttons, raisins for eyes, candy corn for nose, licorice for arms and fruit snack roll for scarf. Add cookie half for hat and pretzel rod for hat brim. Top blue area with snowflake sprinkles. Place waxed paper circles on frosting. On frosting outside of circles, drop food color, swirl with knife. *Percent Daily Values are based on a 2,000 calorie diet. There are no social login steps defined in Sitecore for this flow!